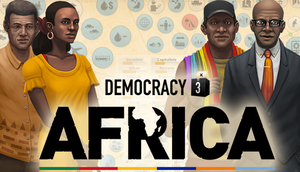 Democracy 3: Africa is a standalone release, Democracy 3 is not required. DLC from Democracy 3 works with Democracy 3: Africa. Automatically flips from normal windowed on native resolution. DLC content is currently only available in English. 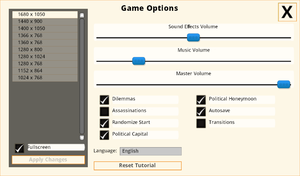 Democracy 3: Africa supports modding capabilites by using .csv files to store gameplay data. Check out the official modding guide if you'd like to mod the game. Mods are found at Positech modding forum or Steam Workshop. ↑ 1.0 1.1 File/folder structure within this directory reflects the path(s) listed for Windows and/or Steam game data (use Wine regedit to access Windows registry paths). Games with Steam Cloud support may store data in ~/.steam/steam/userdata/<user-id>/427470/ in addition to or instead of this directory. The app ID (427470) may differ in some cases. Treat backslashes as forward slashes. See the glossary page for details.